BACKGROUND: public health surveillance (PHS) of industrially contaminated sites (ICSs) is likely to play a role in supporting the monitoring of harmful aspects of ICSs and related interventions. 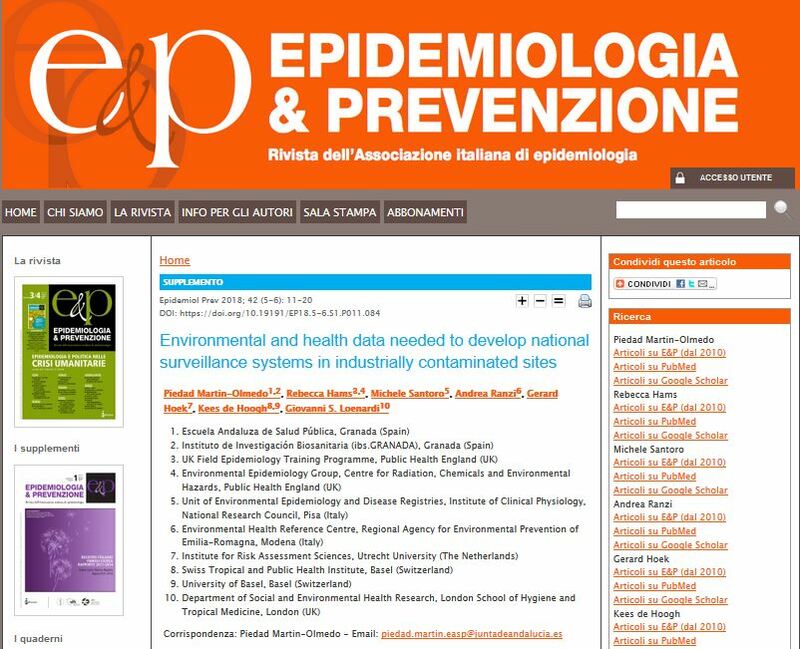 Environmental public health tracking (EPHT) has been proposed and developed as an approach to PHS when environmental factors affecting health are involved. OBJECTIVES: to identify existing arrangements for continuous collection and analysis of environmental and health data to guide the development of an optimal EPHT approach which would support the characterization of the impact on health of ICS. METHODS: a literature search was conducted in PubMed following a structured approach to identify methodological aspects relevant to surveillance of ICSs. In addition, eight further studies on this topic, mainly from three European Countries (Spain, Italy, and France), were included by the research team. RESULTS: the identified 17 examples of surveillance studies include a heterogeneous variety of industrial activities, covering from cross-national to local scenarios. Continuous monitoring systems for gathering environmental data related to ICSs were used only in two cases; a qualitative approach and/or punctual sampling for soil, air, and water of local foodstuff took place in the rest. Exposure assessment was conducted according to four main methods: qualitative definition for the presence/absence of a source, distance to a source, dispersion modelling, and biomonitoring. Health data relied on routinely vital statistics, hospital admission records, specific morbidity registers, and cancer and congenital abnormalities registries. DISCUSSION: our revision identified an overall lack of national surveillance programmes of ICSs, rather than gaps in individual dimensions of surveillance. The epidemiological approaches reviewed provided methods, some of which could be adopted for an EPHT in ICSs. However, a large proportion of examples suffers from poor exposure characterization, relying on a qualitative definition approach, which cannot account for the multiple pathways that take place in ICSs. Use of more individual data from health registries combined with improved environmental data collection and exposure assessment would improve future surveillance.